Injured? Pay nothing until we win! Page Law provides each of our clients with INDIVIDUAL ATTENTION from the moment we are retained, through the final resolution of your case. Our lawyers will give you and your case the quality service and focus you expect. Our team of lawyers, paralegals and case managers have been hand-picked for their exceptional reputations and DEDICATION to our clients. 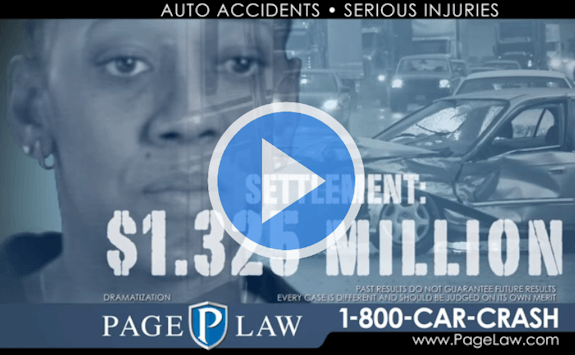 Our injury lawyers have RECOVERED TENS OF MILLIONS of dollars in compensation for clients. Below are some of our recent results in personal injury cases. They worked hard to get me and my family everything we needed and deserved in respects to my case. I couldn’t be any happier with the help I got from them! We handle serious injury and death cases related to traumatic events. The majority of our injury cases result from tractor trailer crashes, truck accidents, bus accidents, and motorcycle accidents. Our lawyers use the latest technology available when handling injury cases. This helps maximize our client’s recovery in a thorough and efficient manner. When marital issues arise, it’s important to have experience on your side. Our family law attorneys are experienced in helping in these difficult situations. We are skilled at making the best of bad situations in an aggressive, yet caring manner.